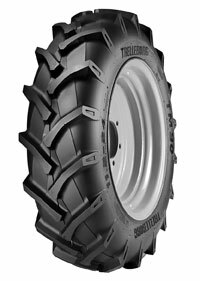 Engineered as a tubeless tire, the new R-1 tread pattern can be used in a variety of application, both in the field and on the road. The typical Trelleborg tread pattern provides excellent traction in all field conditions further enhanced by the interlug terraces. This typical design at the base of the lugs helps the tire to self clean, minimizing soil carried from field to road. The wide lug nose assures extra life on hard surface while the special compound applied provides long wear capability. The dual angled lugs ensure a comfortable ride on the road and additional traction capacity in the field.